Would a fruit cocktail flavoured cake work? I am baking a Cinderella Princes cake for my daughter's first birthday party. I have now had the crazy idea of having a rainbow cake under the skirt of the dress. Not only this, but I had another crazy idea of making each layer of the rainbow cake taste fruity, in the thought that it would make a fruit cocktail taste. Would this fruit flavour combination work? Do you know of any similar cakes? Orange and lemon cakes are classics, so there shouldn't be any problem making those layers. I'm not entirely sure how you'd go about making the others, but there should be a way to incorporate fruit puree into cake batter so that the cakes still rise and set. Blueberry, blackberry and raspberry can all be added whole or slightly chopped into a cake (think blueberry muffins), although they do make it moister so you'd want to be careful it doesn't end up too wet. This might work for kiwi and strawberry but I've never tried it with anything like those. 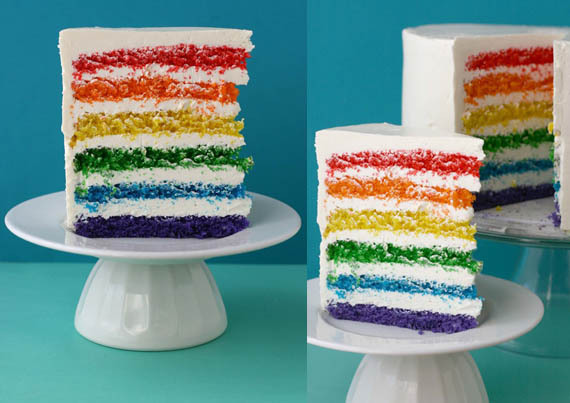 You might need a bit of food colouring if you want to emphasise the visual aspects of rainbow layers. Well if I were to attempt this I'd try to use jello for the flavor and the color. Realistically though, the icing and ice cream on the cake are the real flavor aspects. Lids don't care that you slaved over the oven; put ice cream on anything and they are happy. After separating the white cake mix into four seperate bowls, add a teaspoon or so of the jello mix and stir it in till you get the color you want, then pour the first color in the pan, and each color carefully over top til you get all four layers. Put yellow on top so the icing looks lighter. If I wasn't worried about layers, I'd drag a knife through it and marble it. Not the answer you're looking for? Browse other questions tagged flavor cake fruit sponge-cake or ask your own question. What is the best technique to put icing on plastic? How do I add butter to a sponge cake? Which part of yellow cake batter gives it the yellow cake flavor? How to keep the fruit on an upside-down cake? Can I replace treacle with molasses in my fruit cake? Sponge cake with only three ingredients - will this work at all? Sponge cake - Why mix milk and butter instead of folding? Is this sponge cake recipe correct?